[125 Pages Report] The scale-out NAS market is estimated to grow from USD 12.58 Billion in 2017 to USD 32.68 Billion by 2022, at a Compound Annual Growth Rate (CAGR) of 21.05% during the period 2017–2022. The base year considered for this study is 2016 and the forecast period considered is 2017–2022. The scale-out NAS market ecosystem includes players such as Dell, Inc. (US), Hewlett Packard Enterprise (US), Nasuni Corporation (US), NetApp, Inc. (US), Hitachi Data Systems Ltd (US), IBM Corporation (US), Panasas, Inc. (US), Pure Storage, Inc. (US), Tintri, Inc. (US), Scality, Inc. (US), Nexenta Systems, Inc. (US), and Quantum Corporation (US) that provide varied scale-out NAS software and services. 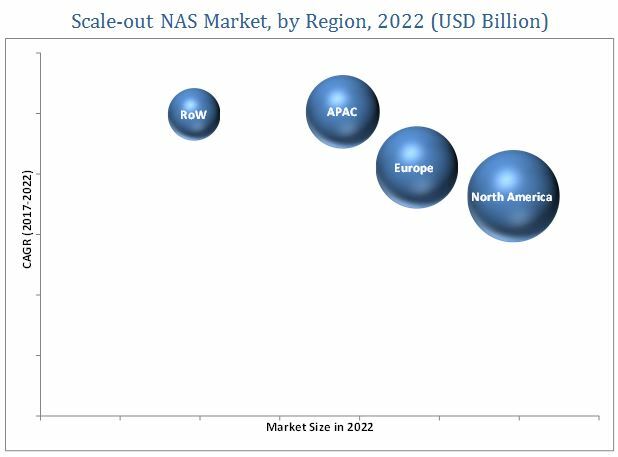 The scale-out NAS market size is projected to grow from USD 12.58 Billion in 2017 to reach USD 32.68 Billion by 2022, at a Compound Annual Growth Rate (CAGR) of 21.05% during the forecast period. The major drivers for the upsurge in the market growth include the increasing demand for scale-out NAS applications across enterprises. The report covers the market analysis by component, storage technology, deployment type, organization size, vertical, and region. The component section is further segmented into software and service. The services subsegment is projected to grow at the highest CAGR during the forecast period owing to the extensive adoption of scale-out NAS software by various enterprises, such as BFSI, government & defense, healthcare, and retail to increase the efficiency of their storage systems. These software help in storage of rich content data files and big data sets, data archiving and backup, disaster recovery, data management & integration, data security, and high-performance computing. These features make data storage more scalable, secure, and easily manageable. The services subsegment is expected to create enough growth opportunities for the scale-out NAS market. Scale-out NAS services have been categorized into professional services and system integration. The banking, financial services & insurance (BFSI) vertical segment is expected to have the largest market share in 2017 owing to the generation of voluminous data in this vertical which creates the need for highly secured data storage solutions. The scale-out NAS technologies enable advanced data storage techniques which help provide better solutions and services for the BFSI industry. New and improved financial products and services are frequently introduced by the BFSI organizations to enhance their business operations and expand their customer database, which makes the industry a lucrative market for scale-out NAS technology. The scale-out NAS market is projected to witness significant growth in the Asia-Pacific region during the forecast period due to the increasing adoption of advanced storage technologies and rising amount of data generation. Increasing requirement of cost-effective storage solutions is expected to boost the adoption of scale-out NAS by SMEs and startups in the region. One of the restraining factors that affects the growth of the market is the lack of technically skilled personnel. The scale-out NAS market vendors profiled in the report include Dell, Inc. (US), Hewlett Packard Enterprise (US), Nasuni Corporation (US), NetApp, Inc. (US), Hitachi Data Systems Ltd (US), IBM Corporation (US), Panasas, Inc. (US), Pure Storage, Inc. (US), Tintri, Inc. (US), Scality, Inc. (US), Nexenta Systems, Inc. (US), and Quantum Corporation (US). 13.5 Hitachi Data Systems Ltd.